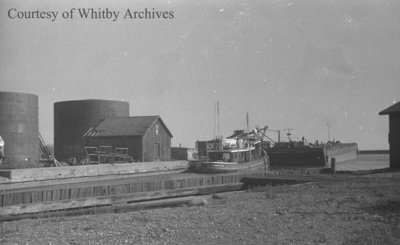 A black and white negative of the Whitby Harbour taken on October 19, 1938. The Argo Oil Tanks are visible at left and a tugboat and barge are visible at centre. The Argo Petroleum tanks were built at the Whitby Harbour in 1938 on the east side of the harbour. The tanks were replaced by larger oil tanks circa 1947 and were demolished in the early 1980s. Whitby Harbour, October 19, 1938, Marjorie Ruddy. Whitby Archives A2013_040_733B.